DIY chain warns of cyber criminals offering vouchers. 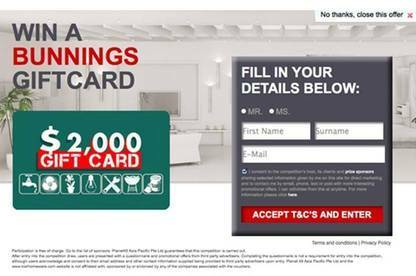 An online scam is using the name of Bunnings Warehouse and trying to lure people in with the offer of vouchers. 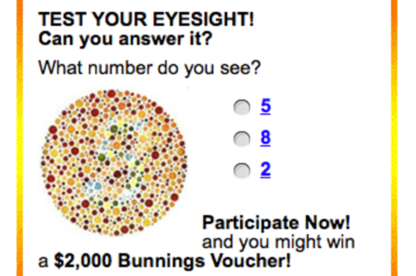 Those behind the scam are using adverts on popular websites, including Facebook, and sending emails telling people they can enter a competition and win up to $2000 of Bunnings vouchers. Bunnings has confirmed they aren’t behind the ads and emails. Some people have also reported seeing variations of the ads using the names of Kmart and JB Hi-fi. Netsafe's digital project manager Chris Hails said the aim of these ads and emails was to harvest personal information from vulnerable internet users who fall for the prize hook and can then be sent other "spam". This is one way the scam can display. Do not click on this ad if you see it on a website. "And secondly to possibly infect computers with drive-by download malware attack kits, which look for security holes on unprotected devices," Mr Hails said. Consumer Affairs and Bunnings encourages customers to help eliminate these scams by reporting their experience at The Orb. An email that appears to be from the Ministry contains a potentially malicious hyperlink. We are writing to let you know of progress and recent update within Ministry for Primary Industries, details has been attached via a secured message. Kindly CLICK HERE to view. If you receive the email, do not open it and do not click on the webpage hyperlink. The Auckland Deaf Society has received reports of a man who calls himself Chris Rock contacting people on Trade Me and asking for their Paypal details. He tells people he is deaf and works for the Auckland Deaf Society. The Society does not know who he is and is warning people to ignore any requests from him. They have reported it to Trade Me and the police.